Stewart R: Wow, this week really is all about the number 3 it would seem. I'm picking up four #3s, and three #17s in something of a strange twist. So firstly, what would all of these titles that have made it past that difficult second issue be? 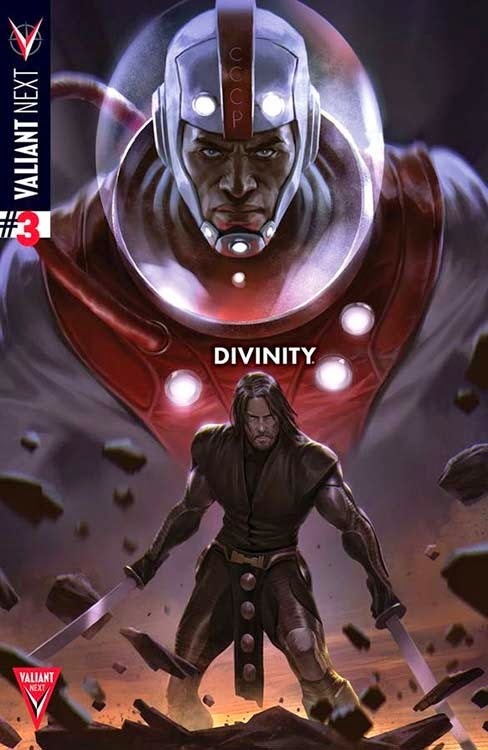 Top of the list for me this week is Divinity #3 from Matt Kindt and Trevor Hairsine, straight out of the buzzing publishing house that is Valiant. They hit the mark with mini-event, The Valiant, in the past few months and this similar-sized story has now rolled some of the familiar faces from the ranks of heroes in their canon into the fold. I'm loving the idea of Cold War Russia aiming far further than the moon during the height of the Space Race and Kindt has kept an emotional heart beating at the centre of this physics-bending story. We'll see where it goes from here. Postal #3 on the other hand, will likely show a distinct and purposeful lack of emotion thanks to Bryan Hill and Matt Hawkins fine portrayal of a protagonist with Asperger syndrome, immersed in a town where every occupant has a criminal past. This has turned into a murder-mystery with a very unique feel to it and I'm looking forward to seeing what darker secrets float to the surface this time around. Kenny J: After the first arc of Star Wars I was all ready to give the book up. Not through any lack quality or satisfaction at the story being told but just that the amount of new upcoming titles was going to leave my pull-list bursting at the seams. This past weeks events has made me reconsider as I realise just how much I love spending time with these characters. Jason Aaron's handling of the big personalities in this comic is fantastic and will be just the thing to stem my excitement until December. A lot of those upcoming new titles hit my local comic shop this week too. First up is Drones. This book follows two drone operatives as their job becomes more difficult when the war they were fighting from their office hits their home city of Las Vegas. Also coming from IDW this week: I was a big fan of the original Mark Waid penned Empire so I'm hoping Empire Rising will contain more of the political soap opera that I enjoyed so much. Think Doctor Doom does Dallas. From Image there is Kaptata #1, written by Chip Zdarsky, a comic that seems very much suited to my tastes with great art by Kagan McLeod. There are also a number of ongoing favourites that are now in their teens including Deadly Class and Lazarus. It shouldn't be forgotten just how great these two titles are. As the newer titles come and go, Remender and Rucka respectively would have to go really off the boil for me to drop these books now.